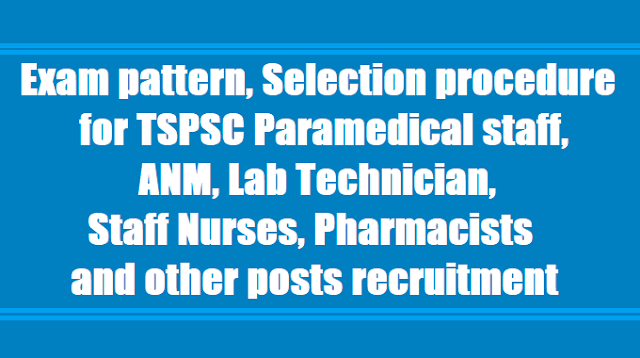 Scheme of Exam, Selection Procedure for TSPSC Paramedical staff, ANM, Lab Technician, Staff Nurses, Pharmacists and other posts 2017: Exam Pattern, Selection Procedure for TSPSC Nursing, Paramedical staff and other posts 2017. TSPSC to fill Paramedical staff, Lab Technician, Staff Nurses, Pharmacists and other posts 2017. Nursing & Para Medical posts in Health Medical & Family Welfare Department through Telangana State Public Service Commission. GOVERNMENT OF TELANGANA- Public Services - Direct Recruitment - Scheme of examination for filling up of Nursing, Paramedical & Other Categories through TSPSC - Orders -Issued. 2. O.Ms.No.166, HM & FW (B1) Deptt., Dt. 09.09.2017. In the reference 1st read above, the Secretary, Telangana State Public Service Commission has requested to issue orders for the Scheme of Examination for filling-up of Paramedical & Other Categories in HM & FW Department. Government in the reference 2nd read above have further issued the departmental guidelines i.e. details of service rules, qualifications and selection procedure etc., in relaxation of Rule, 9(b) of the State and Subordinate Service Rules, 1996 for filling up of certain administrative, Nursing & Para Medical posts in Health Medical & Family Welfare Department through Telangana State Public Service Commission.